Have you ever wondered where David finds ideas for music to fuel our worship? One of his favorite sources is the annual conference of the Association for Unitarian Universalist Music Ministries (formerly the UU Musicians Network). 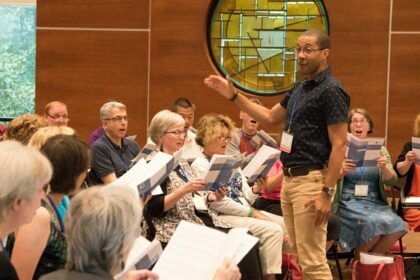 This year, because of the place of privilege White composers have enjoyed since the advent of musical notation, and as one response to repeated calls from AUUMM members and UU congregations for increased visibility of works of composers of color—and with the greater goal of increasingly de-centering Whiteness in the music ministries we support—the AUUMM Conference Planning Committee (of which our own David M. Glasgow is a member) has committed to featuring only the works of composers of color in repertoire sessions for the 2019 conference. Deadline for submissions is Friday, May 10. Let’s keep drawing the circle wider!